As we prepare for the restart of League play on the island this coming weekend, which then turns into the start of Cup play mid February, then Provincial Cup play in April, there was one last set of games to play out – the VISL v FVSL All-Star games. 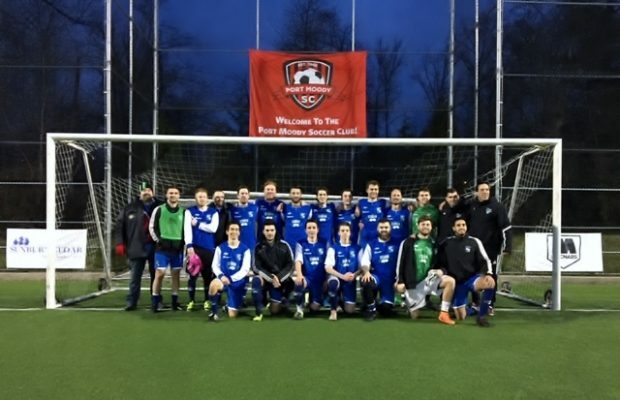 The tradition continues, and there was no lack of excitement as the All-Star games came to a close this past weekend at Trasolini Turf, home of Port Moody Soccer, of the FVSL. We could not have asked for a more gorgeous day, and the park was busy with kids playing some of their matches before the two Men’s league teams took to the turf. The first game was between the Masters teams of each league, comprising of players 35 years plus. The VISL side was coached by Moreno Stefani of UVic and Kevin James of Cowichan, and we thank them for their efforts. After 90 minutes, the score was 2-2, so the result of the game needed penalties to crown a winner, and somehow the Fraser Valley team was able to leave the victor, scoring all five of their attempts, while the travelling VISL team only scored four. Most in attendance were shocked it went that far as the VISL team carried the play for the majority of the game, but could not capitalize on their many opportunities and possession of play. It even took a late goal for the VISL group to send it to penalty kicks. A strange game to say the least. Scoring for the VISL was Dean Anderson of UVic Alumni and Vladimir Music of Gorge FC. The VISL man of the match honours went to George Thomas of Cowichan 49ers, with an honourable mention to Vladimir Music of Gorge. The second game was the feature match of the days as the VISL Division 1 All-Stars took on their counterparts from the FVSL Premier Division. This game was looking to be a tough match, especially as some of the Fraser Valley brass were heard saying that this was the best team they had ever put together. The VISL team took some extra work to put together, unlike how smoothly the Masters team went. Work commitments, family situations, and players that were last minute missing in action led to some unbelievable shuffling and work by the coaching staff. Led by Richard Fast and Nico Craveiro, they did a fabulous job in putting together a team under tough circumstances. And do the job they most certainly did. Against all odds, and by all accounts against what many locals were saying, the VISL squad was victorious and did so in amazing fashion. The 3-0 win not only secured the Championship trophy, but also gave the VISL the total goals for ratio which secured the overall championship and bragging rights for one full year. The first goal of the game was scored by Bays Utd player Adam Ravenhill. Not known to be a goal scorer, he was in the right place at the right time and put the group up 1-0. Almost right away, the VISL team found a second goal – this time by Lakehill’s veteran Blair Sturrock. He was able to find the corner of the net while the Fraser Valley team might have still been talking about the first goal. The VISL squad took a 2-0 lead into the changing room, after a very solid first half and a couple of great saves by Vic West keeper Nolan Wirth. It was a treat to see him play like an extra defender back there at times, with excellent communication and control of the box, and top class distribution! The break came and went, and after bout 15 minutes of play, Fraser Valley seemed to be living in the VISL half. They were controlling the play, and the VISL boys had to do a lot of defending. It was very impressive to see superb play from not just Ryan Ashlee or James Rhodes of Bays, but also the work from Mateo Kostering of Mid Isle and Bobby Eng of Bays. They were great, as was goalkeeper Geoff Hackett (last years Keeper of the Year) of Nanaimo United, who came on as a second half sub. Hackett was called upon to make a couple great saves and needed to control the 18 yard box. He did, and preserved the clean sheet. 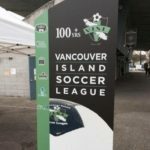 As Fraser Valley were pressing, the Island coaching staff knew it was time to send in VISL veteran Steven Scott of Cowichan. They knew he would be the unsung hero in many ways, and provide that leadership, and he brought in a burst of energy. The team was quickly rewarded as Scott set up the killer third VISL goal. Probably the youngest player on the field, former Whitecaps Residency player Nicholas Budisa of Vic West was sent in, making no mistake after a great first touch, then firing home the third goal. That sealed the deal with the Vancouver Island team, and their fans, stunned…..and quiet. What a win! As the full time whistle went, the team gathered for a photo, and it will go down as the most impressive win of the year so far! Game MVP was Ryan Ashlee, the center back from Bays Utd, with an honourable mention to Nicholas Budisa of Vic West. The change room stop was brief, with Port Moody Soccer Club hosting all four teams in their clubhouse. There was plenty of banter to be had, many egos took a hit, but it was a good celebration as we all are involved in the beautiful game. After the MVP presentations were complete, there was one more presentation to be made, and that was for a cheque donation to the Charity of Choice by both leagues. While all teams had no problem battling each other on the field, it was clear that at the end of the day, there is a special bond that keeps us all involved. Both Leagues decided to kick start the MS Kick for the Cure with a cheque for $1500.00. The cheque was presented to Kevin James of Cowichan Masters who has been a long time VISL player, and now coach. Darcie James (Kevin’s wife) was diagnosed with MS many years ago. They have worked tirelessly to raise funds and awareness for MS, so we all thought it was an easy decision to make the presentation. And there might have been a couple of sets of watery eyes as Kevin received the news and addressed the group. I think at the end of the day, that might have been the best part of the day… mind you the bus ride home was right up there as well! Thanks to the Fraser Valley Soccer League for hosting, the referees who did an excellent job, the fans who offered constructive criticism, media, photographers, and all the players who made time for this event. We look forward to the games in Victoria next year.